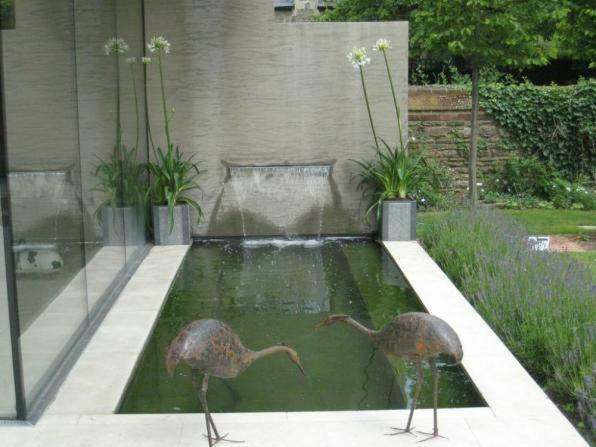 Spiering & Co | Beautiful Contemporary Water Features! A Koi Carp pond with a difference! This contemporary water feature is set in a very long, narrow garden, where in order to widen the feel of the garden, I based the whole design on a 45% angle off the house. The terrace leading out of the house is on a higher level than the rest of the garden, giving me the perfect opportunity to place a letterbox fountain into the back of the retaining wall to fall into the rill which I designed to lead you to the Koi Carp pond. The main specification was to design a water feature where the Koi Carp could enjoy a nice swim, and that they do, swimming up and down the rill before returning to the deep square pond which is their home! Many contemporary designs use a straight line grid, which gives the design an edge to it. However you can see from the 2 photos above that curves can also be quite seamless ad can add a slightly softer look to the design. This town garden is in Headington in Oxford, and I designed an Indian sandstone circle whose outer edge I partly removed to give me a small semi-circular rill with 2 bubbling Oase water jets. In order to give a nice stone outer edge to the water feature, I designed a circle of 100mm sq. stone setts to go right around the circle. The heron you can see lurking amongst the plants is a sculpture made from recycled metal in Zimbabwe. Sticking to urban gardens, the photo above is of a garden in Fulham, London, which was part of a refurbishing development we did of both the house and the garden. We opened up the basement of the house and created a lovely, open plan kitchen and dining area, which led out through fully glazed doors onto the patio you see here. The stainless steel water feature, which has lights and which has water dribbling down the stainless steel wall onto large rounded pebbles at the base, provides a great, cost effective, maintenance free, focal point to be viewed from the kitchen within. As you can see it even looks lovely in the dead of winter! The two photos above show part of a beautiful large garden in Old Boar’s Hill, Oxford. I took inspiration for this water feature from the Alhambra in Spain, with its small jets of water set in the sides of the water feature and which then splash into the middle of the water feature. Again we used Indian Sandstone for the patio and for the surround of the water feature, and I created a stepping stone pattern down the two sides of the feature. I always specify that the base of a water feature is black, as I feel this helps to provide the wonderful mirroring effect you can see in the photo above. The photo above is of a wide letterbox fountain splashing into the water feature below, which is seen through a glazed wall at the end of the kitchen/dining extension of a beautiful house in Longworth. 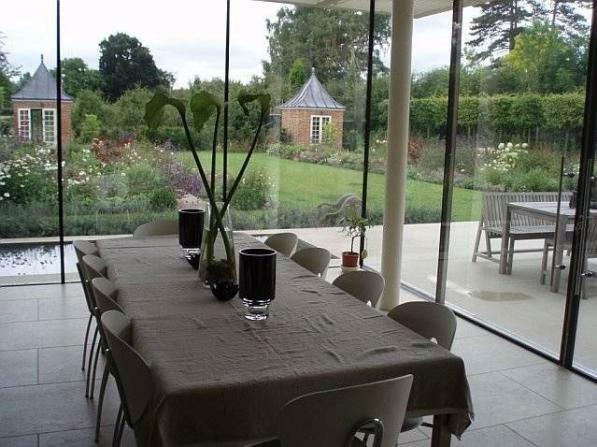 This extension was fully glazed, so very contemporary, and the interior kitchen/dining wall was of brushed concrete. All I did was extend this interior brushed concrete wall into the exterior, so that the water feature almost becomes part of the kitchen extension. This garden was for a young family, and they wanted to be able to use the feature for dipping into as a pool, for their young children. So down the length of the outer edge of the water feature I designed a step, so that it could be accessed easily, or just used as a footstool whilst you sit on the edge of the pool. The whole patio area is edged with Lavender enabling anyone to enjoy the scent of the lavender, whilst dipping your toes into the water and listening to the music of the waterfall. Practical and Beautiful!